nations that rely on the use — and marketing — of nuclear technology, will do everything possible to suppressknowledge about its dangers. This has resulted in public relations campaigns endeavoring to persuade its citizens — as is happening in post-Fukushima Japan —that their “hysteria” and “radiophobia” are causing more illnesses than any radiation that might have gotten out. All nuclear power plants routinely release radioactive gases and water contaminated with radioactive isotopes. When a nuclear plant has a serious accident — as occurred at Three Mile Island, Chernobyl and Fukushima — orders of magnitude more radioactivity is released into the environment. Uranium mining also releases harmful radioactive isotopes and leaves behind radioactive waste. The 1979 uranium tailings pond spill at Church Rock, NM — 90 million gallons of liquid radioactive waste and 1,100 tons of solid mill waste — was the largest accidental release of radioactive waste in US history and permanently contaminated the Puerco River. All of these releases — whether large or small (because there is no “safe” dose) — impact human health with varying degrees of severity. And yet most of the time, these impacts are poorly understood, hushed up, or even dismissed. When discoveries are made — such as increased rates of leukemia in populations living near nuclear power or reprocessing plants — there is an immediate effort by industry, often supported by governments, to undermine, challenge or negate such findings. The fact remains, however, that both the immediate and long-term damage done to human health — which can last for generations — is the single, most compelling reason not to continue with the use of nuclear power and the extractive, polluting industries that must support it. The Radiation and Harm to Human Health chapter of the Beyond Nuclear anti-nuclear handbook, is available now for download and printing as a standalone booklet. 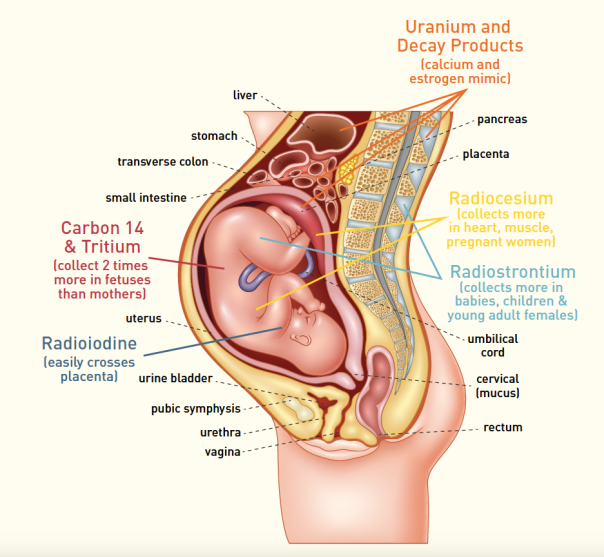 In it, we endeavor to both explain and synthesize the many ways that radioactivity released through the nuclear power sector damages human health, especially the most vulnerable members of our population — women, pregnancy, babies and young children. We begin with some simple explanations about radiation and radioactive releases. When we make the case that nuclear power harms us, it’s necessary to understand the differences between types of radiation and exactly what is released by the different phases of the nuclear industry fuel chain. We also rebut the misleading arguments made by the pro-nuclear lobby about exposures. We explain the difference between internal and external exposures — a very important distinction. We also break down the “natural” versus “man-made” argument. Too often, you may hear suggestions that exposures caused by nuclear plants are no worse than flying in an airplane. The sin of omission is a common tactic by the nuclear lobby. In this booklet, we describe why these arguments are deliberately misleading and unscientific. It is important to remember that the negative health effects caused by the uranium fuel chain are not restricted to radiation exposures. Uranium mining, for example, also releases heavy metals such as lead and even arsenic, just as harmful and in some cases even worse than radiation, depending on the dose. The whole issue of “dose,” of course, and what this means, is also used to cloud facts with mythology in order to suggest that some radioactive releases are not high enough to do real damage. But differentiating between high and low doses is very tricky, depending on whether the doses are delivered to a whole body, an individual organ, or a few cells. For example, even just a single alpha-emitting isotope — such as uranium, radon or thorium —when inhaled or ingested, can impart a huge dose to the cell or cells it travels through. The dose may sound small, but the damage is immense. 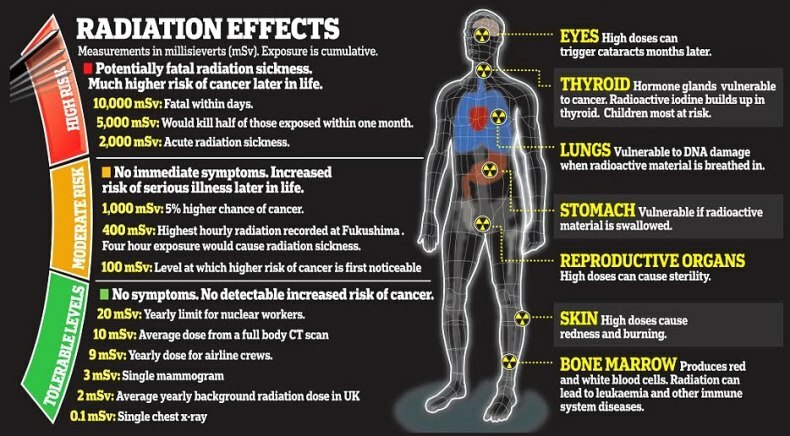 Medical science is in agreement that women are more susceptible to damage from radiation exposure than men. And yet, so-called “allowable” radiation exposure limits are based on a model known as “Reference Man,” a healthy, white male in the prime of life. This means that current “allowable” exposure levels are putting women and children at higher risk of disease than men. Additionally, “allowable” exposure limits mostly ignore impacts on pregnancy, the life stage most susceptible to radiation damage. We make the case that pregnancy, rather than reference man, should form the basis for any exposure standards. Accidents such as Chernobyl have led to lasting and widespread health problems. But these have been hard to record and quantify. Many affected people were never registered, others moved away or have died. The “burden of proof” that Chernobyl harmed them remains on the victim rather than the obvious perpetrator. This has allowed authorities such as the International Atomic Energy Agency (whose mandate is to promote the use of nuclear power) to capitalize on uncertainty by spreading statistics that grossly underestimate the health impacts of nuclear accidents such as Chernobyl. The IAEA gets away with this by using the mouthpiece of the World Health Organization — a seemingly august and reliable authority — to disseminate health statistics related to nuclear accidents. But the WHO submitted to a gag order imposed by the IAEA in 1959, allowing the IAEA to veto any actions by the WHO related to nuclear power. This makes any health figures released by the WHO in relation to Chernobyl or other nuclear incidents highly suspect and likely censored. Similarly, nations that rely on the use — and marketing — of nuclear technology, will do everything possible to suppress knowledge about its dangers. This has resulted in public relations campaigns endeavoring to persuade its citizens — as is happening in post-Fukushima Japan —that their “hysteria” and “radiophobia” are causing more illnesses than any radiation that might have gotten out. Our handbook chapter on Radiation and Harm to Human Health endeavors to keep things concise and simple. We hope you will use it to help educate residents, politicians and the press about the true risks of accepting uranium mining operations, nuclear power plants or radioactive waste management schemes into your communities. We understand that a handbook should be something you can carry in your hand! To that end, we are raising funds to print copies of this booklet. If you would like to contribute, so that we can get this handbook out to the communities that most need it, please donate here. Choose “Handbook” from the pulldown menu to designate your gift. And thank you! Cindy Folkers is the radiation and health specialist at Beyond Nuclear and the primary author of the Radiation and Harm to Human Health handbook. Linda Pentz Gunter is the international specialist at Beyond Nuclear.